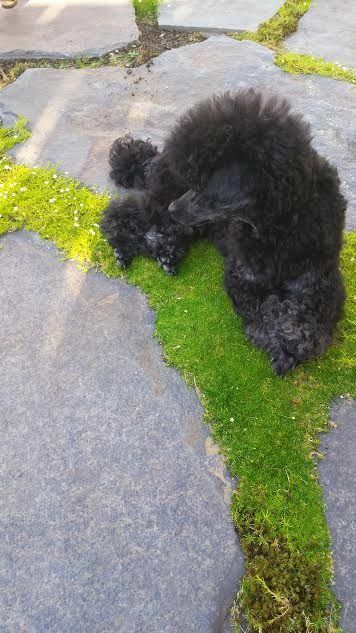 Instant Pot lovers - Poodle Forum - Standard Poodle, Toy Poodle, Miniature Poodle Forum ALL Poodle owners too! I LOVE my Instant Pots. Yep...I couldn't help myself...had to buy a 2nd one. Sometimes you're cooking something but you need to cook something else too and what's better than an Instant Pot? So I wound up with two 6qt. Ultra models. I dove right in with the first one and once you get the hang of it, it's easy. You don't have to hover over a big pot or use too many pots and pans, so clean-up is a breeze. You can even brown your roast or other meat on the saute` function, then switch to another function all in one pot. Meanwhile I use my 2nd Instant pot to make something like rice sometimes. One for a side dish, one for the main dish. It makes perfect rice every time. You can use the pre-programmed settings or custom make your own. I do both. I'm one of those cooks who rarely uses a recipe but in this case, I kind of had to, at least in the beginning and even now just to get use to the timing. But have done a fair amount of experimentation, which is fun. I came across this woman's site (at the top) and like a lot of her recipes and thought I'd share with those who enjoy pressure cooking cooking. lol. I'm planning on making (well...haven't decided for sure yet) a curried lamb stew for my neighbors with whom I've become good friends. We have each other over quite often for dinner and/or cocktails. I've made a curried lamb stew before without the Instant pot...before I had one. And it was delicious. The problem with not using a recipe is I have no idea how I made it. It's very fast cooking. BUT...sometimes it's hard to remember there IS still the prep time. It takes the same amount of time to chop things up etc. And...it doesn't just start cooking immediately. You have to wait for the pressure to build...usually around 10-15 minutes or so. And you have to wait for it to release when done unless you force the release which is good for something where the natural release (waiting) is better for other things. Right now as we speak I'm cooking up my chicken bones that I had for something else to make a nice broth and then I'll strain out the bones (which come out completely mushy) and I'll make chicken soup with that later today. Normally, when I cook bones, I let them simmer all day long...hours and hours. That's how you get the best broth. With this Instant Pot, I set the thing for 120 minutes on high pressure and that's it. So, less electricity, less hovering or checking to make sure the water hasn't evaporated. I can even leave home if I want to without worrying. You can not open the lid until the pressure is gone. So, it's safe. There is a learning curve and I think it's imperative to read the entire booklet before using...twice. There are things that one could do that would be a disaster, such as mistakenly thinking you can deep fry in it. It would explode. But a normal amount of cooking oil is fine. Anyhow, I'm a certifiable appliance junky. And I also love my Vita Mix. Both of these have been used for the dogs food too. Handy dandy. If you have a pressure cooker, tell us what you like about it, what things you've made and if you have any stupendous recipes you want to share... that would be awesome. google instant pot meat recipes and you'll find a lot of actual recipes that may appeal to you and your husband. I own 2 and bought an extra insert as well. I’m cooking lots of basics such as large batches of steel cut oatmeal or beans that I freeze in small zip lock baggies so they can easily be added to a recipe. I also make a lot of soup and I store the soup in the insert rather than transferring it to other containers. I’m not a gadget person. We have a rarely used convection toaster oven and a coffee maker and my two instant pots. I love that I can load it, seal it and walk away knowing that when it’s finished cooking it goes into a keeping warm mode. Now if they invented machine to peel and chop veggies as precisely as I do, I’d buy one of those. Oh yes R&P...what it does is makes the meat come out so moist and tender. I sometimes cook a Czech style dinner and that is pork roast. First I take a smallish roast and sear it in the Instant pot on saute. First you must heat it until it says, "hot" THEN you add your oil. It took me forever to remember to do that. I do not use olive oil as most of the recipes say, but rather use avocado oil. And that's because olive oil smokes at a lower temperature than avocado oil. And low smoke temperature oil becomes carcinogenic when it reaches the smoke point, which happens very quickly when heating up a pan. (I think olive oil is over rated) Anyhow, I put finely chopped up garlic (lots) all over the pork roast and also caraway seeds. And add about a cup to 1-1/2 cups (not sure) broth, maybe some Italian seasoning or something. (can't remember. lol. I'm seriously addled) And turn it to high pressure for about 30 minutes. Look online for cooking times. I'll try to find it but there's a chart. The measurements of the meat is more important than the weight apparently. There should be lots of juice in the end to make gravy but if there isn't I cheat and use one or two of those packages of powdered gravy mix. Isn't that just awful? LOL. Then I make dumplings...the Czech type, not the German type. These are dense...different. And to go with it, a Czech style cabbage. caraway seeds (?) dunno how many. lol. First in a pot on the stove I think the stove is more appropriate for this) saute onion and chopped bacon until limp and just starting to turn brown... but not done...maybe half done for the bacon. Make sure the bottom of the pan has enough oil that the ingredients won't burn but not too much. Then take handfuls of cabbage that you've sliced uber thinly and layer alternately... (a double handful of cabbage) with some salt sprinkled generously over that and caraway seeds sprinkled over each layer of cabbage. Put the lid on and turn on low heat. Only peak a wee bit to make sure it's not sticking. As the moisture starts releasing into the pot you can turn the heat up a little bit, waiting for more moisture to release. The salt helps with that. Once you have enough liquid from the vegetables, you can turn up the heat a little more...to maybe medium. Start turning it over so the undone cabbage gets to the bottom. And so on until it's a nice consistency for you. I like it not too crisp but not over done either...not to where it loses it's bright color completely. THEN....I add my vinegar. I start with one or two BIG table spoons...the kind you stir big pots of stuff with. Then taste. Sometimes you need to add more vinegar. If you get too much vinegar, add a little more salt. If it still tastes like you were heavy handed, add a wee bit of sugar, not too much. And just taste until it's just right. It is really the tastiest cabbage ever. lol. I can get you my dumpling recipe from a Czech cook book upon request. So yes...roasts are really good in there. It cooks without losing moisture. I made some really tasty beef stew. And lamb stew. I'm going to make curried lamb soon. Yesterday, chicken soup. I put some links in my first post with some recipes. Sometimes, because I'm so bad about using recipes, but just make it up as I go along, I think it might be better to have done it on the stove where I can taste it as I go. I mean...you can turn off the Instant pot and test it, then turn back on but you have to wait again for the pressure to build, which doesn't take long when it's so hot still from before. So if I could use more tried and true recipes, maybe I wouldn't have this problem. My chicken soup did not turn out as well as it does on the stove top because I had no idea if I put enough of this or that in. My kids use to say, "OH NO....another one of Mom's inventions!" LOL. Things with a lot of tomato don't seem to work very well under pressure. My spaghetti sauce was a bust. Stove top for that from now on. But anyhow, it's great for a lot of things...one dish meals for instance and it does make meat come out tender. The Ultra model has a yogurt setting on it, which I haven't tried yet but I will. It's a slow cooker, pressure cooker, rice cooker and more...all in one. I love this gal. She explains this so well. Thanks for all the info. I wasn't even aware of the Instant Pot revolution til my mom's old Dormeyer Silver Chef mixer finally bit the dust last year. While looking to replace it, I ran across the IP also in small appliances everywhere and started looking into it. Patk's thread and now this one seem to be leading me back to the quest. Everything sounds delicious and moist and tender meats may close the deal. I need to decide which model and 3qt (just DH and me and he doesn't do leftovers) or 6qt. Poodlebeguiled, your recipe descriptions are priceless, lol. We don't need no stinkin' measuring tools! i have a 3 qt and suggest you look carefully at the 6. even if no leftovers, you may want to cook three items at once, which you can do with a 3-tier kit. if you get an ip, be sure to get silicon pot holders. i've seen the 6 qt duo for about $69. check walmart as well as amazon for those low prices. also, there's supposedly a huge facebook group for ip folks. i don't do fb, but it's out there and gets a lot of plaudits on line. let us know how it goes! LOL. I was looking back to see what you could possibly mean. hahahahaha. And then I saw that I meant to take a little look and spelled peek like Pikes Peak. LOL. OMG! How sloppy of me...kind of like my "recipes." Yep, I'm terrible that way. I think I inherited it from my grandmother. There's a recipe from her that says, "put ingredients in the green bowl." ROFLOL. Yep, It's fly by the seat of your pants when you follow one of my recipes. I really should start measuring and figuring out what I do and write it down. No two spaghetti sauces are exactly alike or any home made soups. While I'm not the best cook in the world with other things, I do get compliments on my home made soups and spaghetti sauce. People ask for my recipes and I have to tell them that I don't have a recipe exactly. lol. I hate jumping on band wagons...I hate trends. And this Instant Pot craze is definitely an explosion of a trend. But I couldn't help myself. I read and researched and thought it would be really neat. And it turns out it's lots of fun. I've experimented, followed recipes and practiced because there definitely seems to be a learning curve, unlike most appliances. There's some getting accustomed to it needed. I mean, it doesn't take more than a few minutes to wind up over cooking something. It's hard with some things because you can't check or taste as you go, if you're use to cooking on the stove top. So herein lies the necessity I think, to begin with real recipes. lol. I don't need my crock pot anymore or a yogurt maker or a rice cooker, steamer, frying pan, roaster etc etc. It really has a lot of functions. I can't remember about all the models, but the Ultra has pre-set function settings so you can just push, "stews&soups" or "rice" or whatever. Or you can choose your own custom settings if you find you want to tweak it a bit. Maybe you want a lower pressure setting or different time. etc. Well, you can read about them in that link above. This one was on sale before Xmas...down to $100. The second one I bought was not...$150 or so. But yeah...you can get other models that may be all you need or want for less. But hay (that was a joke) for another $20-30 buckaroos, who needs to measure, right?